Phoenix has a lot of empty lots. Personally, I've always liked them, as it means less congestion, less traffic, and better views of the mountains. Of course, I'm not an investor, and I'm sure they look at them differently. If you've driven past 21st Avenue and Bell Road since 1988, you've seen an impressive-looking sign that says "Phoenix Northgate", and really nothing else except a chain link fence that goes all around the property. I'll tell you what I know about it, but really it's not much, because all it means is that it was supposed to be a center of a flurry of business, and it never worked out. There, that's about it. It happens all of the time. From what I've read, in addition to car dealerships, there was supposed to be a hotel, restaurants, banks, that sort of thing. It seems like a good location! Back in 1988 it may have been "way out there", but it isn't anymore. Go figure. The funny thing about this is that most people have no idea that this is how these types of places begin, with a name and a sign and a bunch of open land. 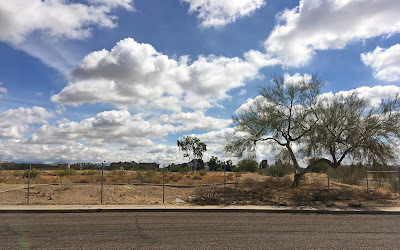 I like driving around Phoenix and looking for the names of shopping centers which have long been ignored. I live nearby Peoria Station, at 67th Avenue and Peoria, which was designed to look like a train station when it was built in the '80s, and not far from Ted's Plaza, which is my personal favorite, from the 1970s, at 47th Avenue and Olive. I've known people who've lived in this neighborhood for a long time and would have no idea what you meant if you said that you were going to meet them at "Peoria Station" or "Ted's Plaza". The reason for these names is simply business, as that before any construction begins, a name is needed. And there's usually some kind of impressive sign. It's the name that is thrown around as "the next big thing", and sometimes it works, and sometimes it doesn't. 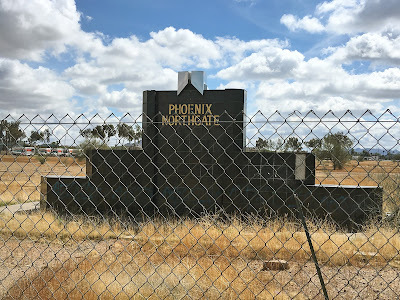 Phoenix Northgate really didn't work. The empty space of Northgate. To me, it's beautiful with the wide vistas and the mountain views. To an investor it's probably not so beautiful! Speaking for myself, I never gave this area any thought until recently when one of my PhDs (Phoenix History Detective) pointed it out to me. I remember the empty roads next to the Lincoln Mercury dealership where I test-drove my Cougar in 2000. That the area had been empty for twelve years previously never occurred me. And those roads curving around nothing are still there, along with the empty sidewalks that were never used. By the way, I just learned that the dealership is part of Northgate, but I don't recall anyone calling it "Northgate Lincoln Mercury". Like I said, I'm not an investor, but even I have to wonder how much it cost to make that sign at the top of this post, which is actually pretty nice, and considering that it hasn't been touched for over thirty years, pretty solid. And then there's the land - someone has to be paying taxes on it, or maybe the city is losing tax revenue on it, which means it's costing the taxpayers. I don't know? 1988 date stamp at Northgate, 21st Avenue and Bell Road, Phoenix, Arizona. 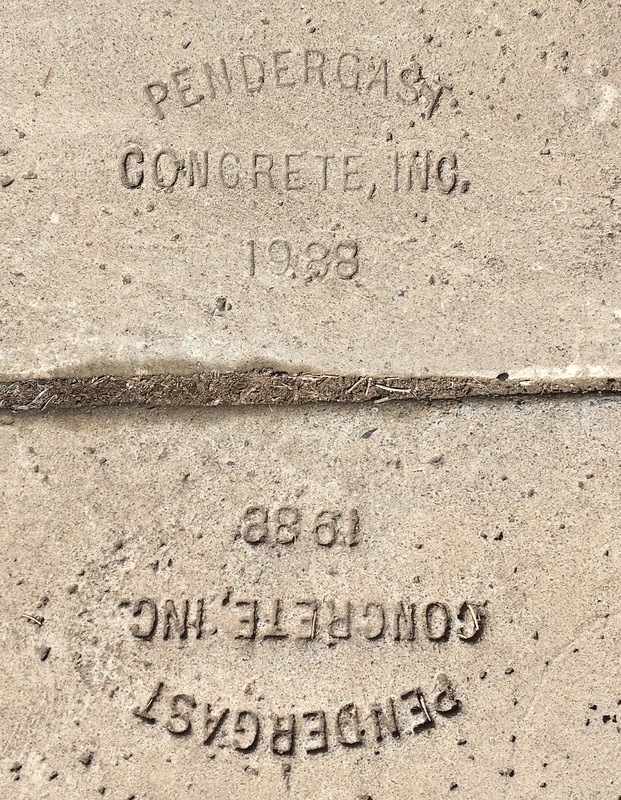 One of the things that I do is look at the date stamps in sidewalks. Sometimes I see really old ones, like WPA from the 1930s, and it really gives me a sense of time-traveling. 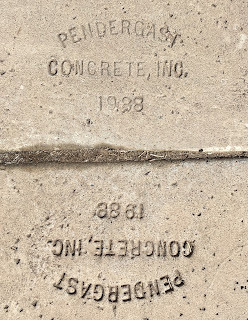 I like to think of the moment when that stamp was in fresh concrete, and the people were standing around, imagining the future. And sometimes it works out, and sometimes it doesn't. 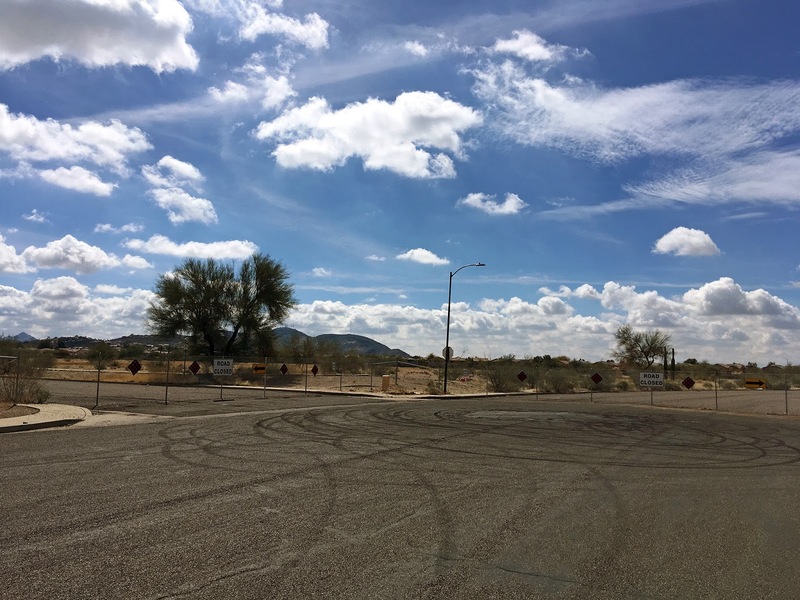 Roads and sidewalks to nowhere, at Northgate near 21st Avenue and Bell Road, Phoenix, Arizona. If you know more about this place, its past, its future, please comment. The history of Phoenix is still being written! All photos by Brian Gotsch. Used with permission.